3) discussion questions to guide your response to Rilke's re-envisioning of the parable. Rainer Maria Rilke was born in Prague in 1875 but traveled widely (from Russia to Spain) and lived in many parts of Europe (Paris, Munich, Zurich). He encountered many of the great thinkers and creative spirits of his day (Tolstoy, Rodin, Cezanne) and influenced generations of posts and philosophers. Although he distanced himself from orthodox Christianity, his highly lyrical and metaphorical writings often touched on spiritual themes. 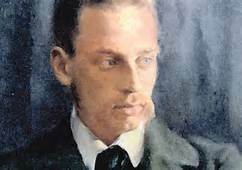 Rilke served as a bridge between traditional nineteenth century thought and the expressionism and existentialism of the early twentieth century. He died in Zurich in 1926. But as a boy he tried to lay aside these habits. He wouldn’t have been able to say it, but when he spent the whole day roaming around outside and didn’t even want to have the dogs with him, it was because they too loved him; because in their eyes he could see observation and sympathy, expectation, concern; because in their presence too he couldn’t do anything without giving pleasure or pain. But what he wanted in those days was that profound indifference of heart which sometimes, early in the morning, in the fields, seized him with such purity that he had to start running, in order to have no time or breath to be more than a weightless moment in which the morning becomes conscious of itself. The secret of that life of his which had never yet come into being, spread out before him. Involuntarily he left the footpath and went running across the fields, with outstretched arms, as if in this wide reach he would be able to master several directions at once. And then he flung himself down behind some bush and didn’t matter to anyone. He peeled himself a willow flute, threw a pebble at some small animal, he leaned over and forced a beetle to turn around: none of this became fate, and the sky passed over him as over nature. Finally afternoon came with all its inspirations; you could become a buccaneer on the isle of Tortuga, and there was no obligation to be that; you could besiege Campeche, take Vera Cruz by storm; you could be a whole army or an officer on horseback or a ship on the ocean: according to the way you felt. If you thought of kneeling, right away you were Deodatus of Gozon and had slain the dragon and understood that this heroism was pure arrogance, without an obedient heart. For you didn’t spare yourself anything that belonged to the game. But no matter how many scenes arose in your imagination, in between them there was always enough time to be nothing but a bird, you didn’t even know what kind. Though afterward, you had to go home. No, he will go away. For example, while they are all busy setting out on his birthday table those badly guessed presents which, once again, are supposed to make up for everything. He will go away forever. Not until long afterward would he realize how thoroughly he had decided never to love, in order not to put anyone in the terrible position of being loved. He remembered this years later and, like other good intentions, it too had proved impossible. For he had loved again and again in his solitude, each time squandering his whole nature and in unspeakable fear for the freedom of the other person. Slowly he learned to let the rays of his emotion shine through into the beloved object, instead of consuming the emotion in her. And he was pampered by the joy of recognizing, through the more and more transparent form of the beloved, the expanses that she opened to his infinite desire for possession. Sometimes he would spend whole nights in tears, longing to be filled with such rays himself. But a woman loved, who yields, is still far from being a woman who loves. Oh nights of no consolation, which returned his flooding gifts in pieces heavy with transience. How often he thought then of the Troubadours, who feared nothing more than having their prayers answered. All the money he had acquired and increased, he gave away so as not to experience that himself. He hurt them by so grossly offering payment, more and more afraid that they might try to respond to his love. For he had lost hope of ever meeting the woman whose love could pierce him. Even during the time when poverty terrified him every day with new hardships, when his head was the favorite toy of misery, and utterly worn ragged by it, when ulcers broke out all over his body like emergency eyes against the blackness of tribulation, when he shuddered at the filth to which he had been abandoned because he was just as foul himself: even then, when he thought about it, his greatest terror was that someone would respond to him.What were all the darknesses of that time, compared with the thick sorrow of those embraces in which everything was lost? Didn’t you wake up feeling that you had no future? Didn’t you walk around drained of all meaning, without the right to even the slightest danger? Didn’t you have to promise, a hundred times, not to die?Perhaps it was the stubbornness of this most painful memory, which wanted to reserve a place in him to return to again and again, that allowed him, amid the dunghills, to continue living. Finally, he found his freedom again. And not until then, not until his years as a shepherd, was there any peace in his crowded past. Who can describe what happened to him then? What poet has the eloquence to reconcile the length of those days with the brevity of life? What art is broad enough to simultaneously evoke his thin, cloaked form and the vast spaciousness of his gigantic nights? This was the time which began with his feeling as general and anonymous as a slowly recovering convalescent. He didn’t love anything, unless it could be said that he loved existing. The humble love that his sheep felt for him was no burden; like sunlight falling through clouds, it dispersed around him and softly shimmered upon the meadows. On the innocent trail of their hunger, he walked silently over the pastures of the world. Strangers saw him on the Acropolis, and perhaps for many years he was one of the shepherds in Les Baux, and saw petrified time outlast that noble family which, in spite of all their conquests under the holy numbers seven and three, could not overcome the fatal sixteen-rayed star on their own coat-of-arms. Or should I imagine him at Orange, resting against the rustic triumphal arch? Should I see him in the soul-inhabited shade of Alyscamps, where, among the tombs that lie open as the tombs of the resurrected, his glance chases a dragonfly? It doesn’t matter. I see more than him: I see his whole existence, which was then beginning its long love toward God, that silent work undertaken without thought of ever reaching its goal. For though he had wanted to hold himself back for ever, he was now once again overcome by the growing urgency of his heart. And this time he hoped to be answered. His whole being, which during his long solitude had become prescient and imperturbable, promised him that the one he was now turning to would be capable of loving with a penetrating, radiant love. But even while he longed to be loved in so masterful a way, his emotion, which had grown accustomed to great distances, realized how extremely remote God was. There were nights when he thought he would be able to fling himself into space, toward God; hours full of disclosure, when he felt strong enough to dive back to earth and pull it up with him on the tidal wave of his heart. He was like someone who hears a glorious language and feverishly decides to write poetry in it. Before long he would, to his dismay, find out how very difficult this language was; at first he was unwilling to believe that a person might spend a whole life putting together the words of the first short meaningless exercises. He threw himself into this learning like a runner into a race; but the density of what had to be mastered slowed him down. It would be hard to imagine anything more humiliating than this apprenticeship. He had found the philosopher’s stone, and now he was being forced to ceaselessly transform the quickly produced gold of his happiness into the gross lead of patience. He, who had adapted himself to infinite space, had now become like a worm crawling through crooked passageways, without exit or direction. Now that he was learning to love, learning so laboriously and with so much pain, he could see how careless and trivial all the love had been which he thought he had achieved; how nothing could have come of it, because he had not begun to devote to it the work necessary to make it real. During those years the great transformations were taking place inside him.He almost forgot God in the difficult work of approaching Him, and all that he hoped to perhaps attain with him in time was “sa patience de supporter une ame.” The accidents of fate, which most men cling to, had long ago fallen away from him; but now even the necessary pleasures and pains lost their spicy aftertaste and became pure and nourishing for him. From the roots of his being grew the sturdy evergreen plant of a fruitful joyousness. He became totally absorbed in mastering what constituted his inner life; he didn’t want to omit anything, for he had no doubt that in all this his love existed and was growing. Indeed, his inward composure went so far that he decided to retrieve the most important of the experiences which he had been unable to accomplish before, those that had merely been waited through. Above all, he thought of his childhood, and the more calmly he recalled it, the more unfinished it seemed; all its memories had the vagueness of premonitions, and the fact that they were past made them almost arise as future. To take all this past upon himself once more, and this time really, was the reason why, from the midst of his estrangement, he returned home. We don’t know whether he stayed there; we only know that he came back. 1) Describe the relationship between this interpretation of the parable of the Prodigal Son and your understanding of the parable? 2) Does Rilke’s retelling help you see some possibility that hadn’t occurred to you in the parable? In what ways do you think Rilke has completely missed the point? 3) What does Rilke mean by describing the parable of the Prodigal Son as “the legend of a man who didn’t want to be loved”? Do you agree? 4) What do you think of Rilke’s suggestion that the Prodigal Son developed a “profound indifference of heart,” longed for a life with “no obligation," desired to behave “according to the way you felt”? a) “The first window up there kept its eye on you; someone might be standing there." 6) Do you find this an ultimately satisfying or unsatisfying depiction of the Prodigal Son? Why?